We are adding to this listing to keep it updated with the latest keyboards from apple. 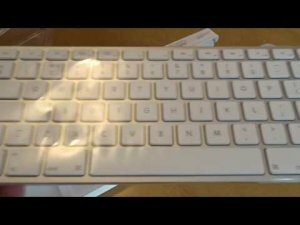 This is a review of the apple keyboard (wired) suitable for all apple products like (*) macbook pro or apple macbook air. As a serious alternative to the bluetooth keyboard, do you really need bluetooth? * ipad iphone (devices wothout a usb port) etc- you will need extra device to get usb connectivity so go for bluetooth. If you are looking for an apple keyboard for your macbook pro or macbook air to use at home so that you can use you laptop in clamshell mode or just to have a larger more convenient way to use your device at home consider the wired version shown and reviewed here. I have use this keyboard with my macbook air for 1 year now and feel that I can say it is still a quality comfortable device as you would expect from apple. I didn't spill anything yet (claims are that it is not spill proof). It is great to have a number key pad and this keyboard has allowed my typing to improve to the degree that I am looking at the screen much more while typing. I have never been very skilled like a very fast typer. I dont get issues like I get typing on the laptop myself. I did find one of the usb ports tight but it works fine in all departments like this. Key travel and noise is exactly the same. If you have an uneven desk then as this is a longer solid piece it will show you that you have a twisted or warped desk. I thoroughly am grateful to use this keyboard and to have realised that I didn't need a bluetooth keyboard.